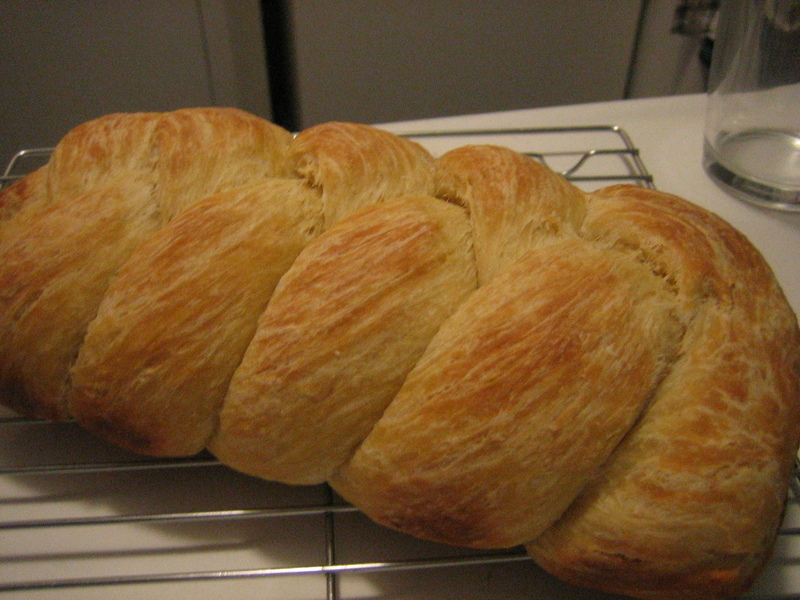 This past week I tried out Mark Bittman’s “Rick Golden Bread” recipe (How to Cook Everything Vegetarian, page 714). Combine all the flour, salt , sugar, yeast, and cold butter in a bowl and mix with your hands until the butter is broken up into the dry ingredients. Slowly add 3/4 cup of milk and mix until the dough is soft and smooth. Add the remaining milk if need-be. It should be slightly sticky. Knead the dough on a lightly floured surface for a few minutes, just until it is smooth. This is a chance to knead in more flour if you need to. 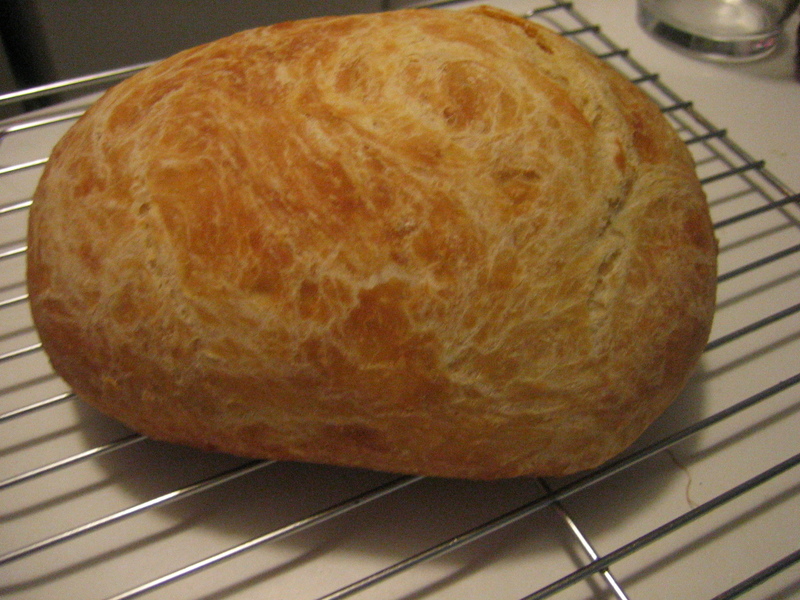 Put the dough in a bowl, cover with a plastic bag and a cloth, and let rise 2 hours. Next, divide up the dough into however many loaves you intend to make. I cut 1/3 off and made a single small loaf with that portion and cut the remaining 2/3 into three pieces to braid for challah. 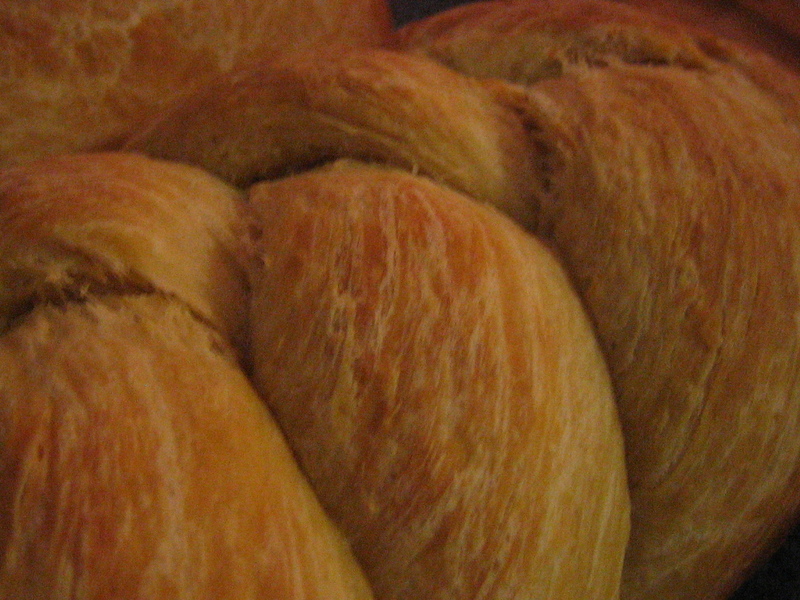 Shape the loaves (for the challah, roll out each section into a snake about in inch thick and then braid them together). Cover and leave them to rest 20 minutes on a floured surface. When they have puffed slightly, use your fingers to seal the bottoms of the loaves and place them in buttered baking pans. Cover and let rise 2 hours. Now, baking: preheat the oven to 350. Brush the tops of the loaves with melted butter. Bake until golden brown (about 40 minutes, or less with out unpredictable and hype-active oven). As a baking guide, we sometimes pull the loaves out of their pans and knock on the bottom: when the bread sounds hollow, it is done.